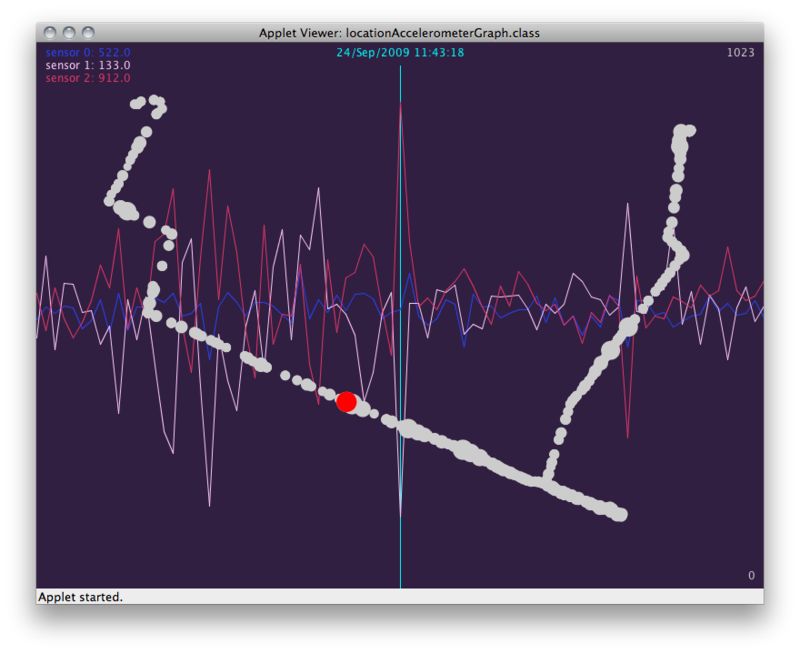 To contextualize the raw accelerometer data I also tracking GPS location and eventually geocoding the raw data in software. 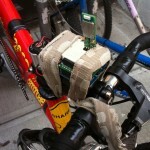 The bicycle sensors are being transmitted via Bluetooth to a mobile phone and the data is logged with a custom written (but now open-source!) python script. Below is the first draft of the visualization. I intend to add more sensors to record internal forces to see if there is a physiological response (HR, GSR, breathing, pressure on contact points) to external factors such as speed, traffic / road / weather conditions, time-of-day etc. 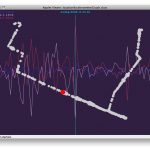 Video demonstration of the initial visualization. This entry was posted on Monday, September 28th, 2009 at 13:47	and is filed under itp, Rest of You. You can follow any responses to this entry through the RSS 2.0 feed. You can leave a response, or trackback from your own site. Very cool. Especially since this is the first time I understand what you were doing ! Nice project you got there, I was thinking of something similar (just GPS and acc. meter) for my first semester project. Is there a way, to be able to use this python script on iPhone? I have iphone 3g, but no s60 phone arround, so i’m looking for a implementation of that if possible. I’m not aware of a way to run python scripts (or any interpreted language) on the iPhone. Also, Bluetooth on the iPhone has very limited functionality, so I don’t think that writing an Obj-C version of the data logger would make a difference. I have an older Nokia 6682 which I keep around just for things like this. I would love to see a satellite view map under the track so you can see the terrain you are passing over at each point of the track. Try earth.google.com or motionbased.com We’ve used standard GPS data collected in cars in Google Earth to visualize driving routes. 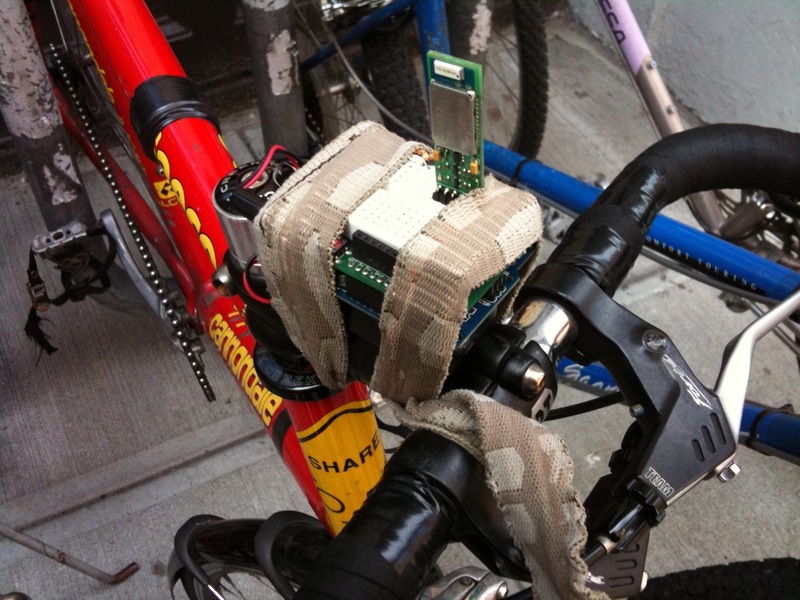 I’ve been planning my own bicycle data logger in my head for some time now, and I think the accelerometer is key to determining instantaneous power output, particularly on slopes, as it acts as an inclinometer. I was interested to see it used for evaluating riding forces. You may be interested in the International Roughness Index. I think NHTSA or US DOT has some massive databases on roadway roughness. I’d love to take the Garmin Edge 305 and add accelerometer data to it. The 305 already has GPS, crank and wheel speeds (can determine the gear you selected), but I doubt the GPS altitude information can indicate the slope accurately enough to determine the force.